This is a Television Tie-in, originally published (in the UK at least) in 1983. Designed to smooth over the gap between the end of Season Four and the beginning of Season Five, it tells the story of the exact circumstances behind Bo and Luke deciding to leave the Farm and becoming professional drivers on the NASCAR circuit. This is actually surprisingly well written, and reads like a true feature-length episode. Eric Alter uses the device of making us believe that the book has been written by the character of the Balladeer, and combines the fast-paced racing story with some pleasant little ‘family moments’ in keeping with the style of the TV Series. If you can locate a copy, this is well worth reading. A rather disappointing Playstation adventure, which looked primitive even on its release. The various missions which you’re required to complete are extremely easy to accomplish, and (even on the ‘Tuff’ setting) I was able to complete the entire game in the space of an afternoon. The Two Player games are quite fun, but the PSOne graphical degradation in the split-screen mode is so severe that it’s actually very difficult to understand what’s going on. However, as the game is now available at a Budget price of only £5 or so, it may be worthwhile giving it a go. DUKES OF HAZZARD:DAISY DUKES IT OUT. Marginally better than the previous adventure, this at least allows the player the option to charge around a Virtual Hazzard County without having to partake in any specific missions. 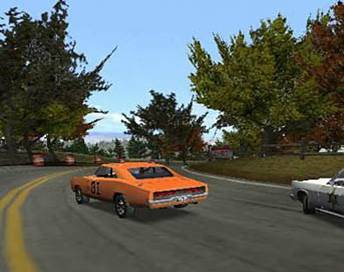 Regrettably, the graphical quality is unchanged from the previous game, with the result that the entire landscape appears bland and rather too pixellated. The handling of the General is a little too jerky and nothing like as fun to drive as you would like. The individual ‘missions’ themselves are pretty much as you would expect, and the two-player options are almost exactly the same as those in “Racin’ for Home”. 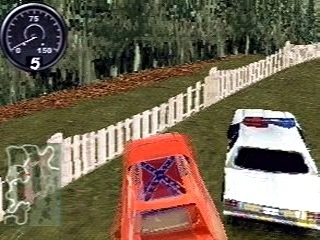 However, the Virtual Hazzard is unquestionably a sizeable place to explore, and the scenery is often nicely interactive (fences can be smashed over; bales of hay can be knocked out of the way). At £5, this is probably better value for money than the first game and will certainly wile away a day or two. At last, a game worthy of the Dukes name! As you would expect from a PS2 game, the graphical quality really is quite superb, with every building, every rock, every tree (and even every blade of grass!) appearing detailed and realistic. 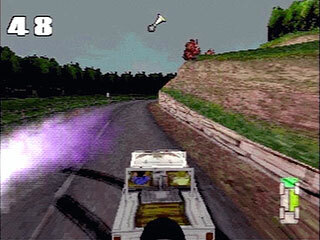 The General (and all the other assorted vehicles) look exactly like the real thing, and the game itself is huge with a plethora of missions to achieve. The beauty of this game, however, is it’s accessibility; should you determine to take part in the actual storyline, there are a number of different ‘missions’ you can choose from in order to succeed; meaning that the subsequent re-play factor is high. Two-player mode is far more enjoyable than on the PlaystationOne versions, due to the higher graphical quality; and the ‘take a ride’ option is just what is needed for instant gratification. Hazzard looks quite superb and incredibly detailed (from the stonework of the buildings in the Town Square to the rocks and gullies of the Old Quarry), and is a pleasure to drive around. 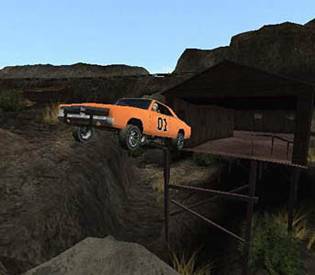 Here and there throughout the county you encounter many jump opportunities, most of which reward you with a slow-motion 3rd-person replay (and bonus stunt points!) My only complaints are the handling of the General (still a little too twitchy),the occasional severity of the individual missions (there is no opportunity to save until each one has been fully completed) and the fact that the scenery is now so detailed it ironically disappoints because it doesn’t always look EXACTLY as it does in the TV Series! (The Duke Farm and Hazzard Square, in particular, have been re-designed). Nonetheless, this is £20 very well spent and will keep you thoroughly entertained and absorbed for weeks, if not months.